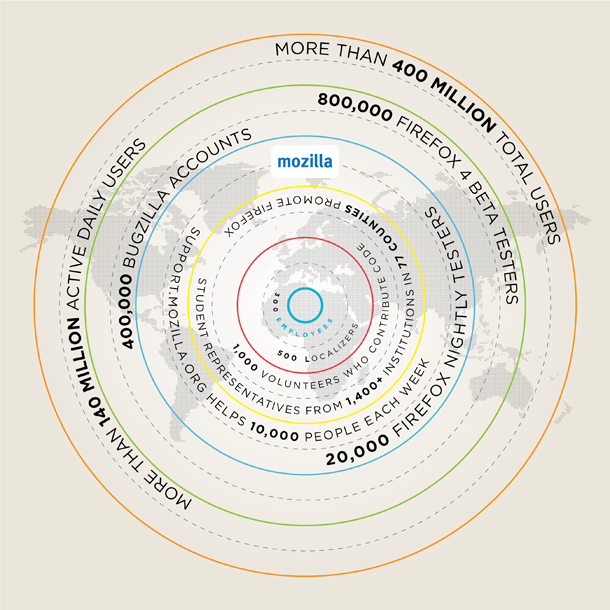 Mozilla has just published their annual “The State of Mozilla” report. They do this once they’ve filed their audited financial statements for the previous year, so these numbers are for 2009. Still, they’re impressive numbers given how much competition their is in the market — particularly from their biggest benefactor: Google. The majority of Mozilla’s revenue is generated from search functionality included in our Firefox product through all major search partners including Google, Yahoo, Yandex, Amazon, Ebay and others. Mozilla’s reported revenue also include very important individual and corporate donations and grants as well as other forms of income from our investable assets. The relationship between Google and Mozilla is an interesting one because Google has its own browser, Chrome, that competes with Firefox. And by all measurements, Chrome continues to gain market share at a rapid pace. While it still looks as if most of the share they’re taking is from industry leader Internet Explorer, Firefox’s growth has slowed down significantly since Chrome started to take off. In the “Competitive World” section of their report, Mozilla dives into why they believe Firefox 4 is going to take the browser to the next level. The latest version is in late-stage beta testing and should be out shortly. Here, they also rattle off some big numbers for Firefox, such as more than 400 million total users, over 140 million active daily users, and 800,000 Firefox 4 beta testers. Going forward, Mozilla outlines how they’re putting an emphasis on mobile, apps, sharing and syncing, their Drumbeat project (promoting the open web).